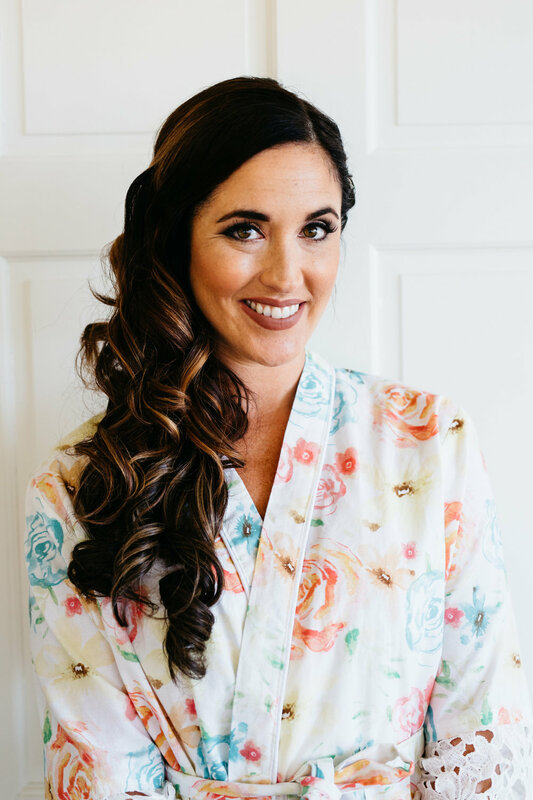 When I first met Rachel I was immediately in love with her vision for her wedding. She wasn’t afraid to think outside the box and together we were able to create such a beautiful and romantic evening. 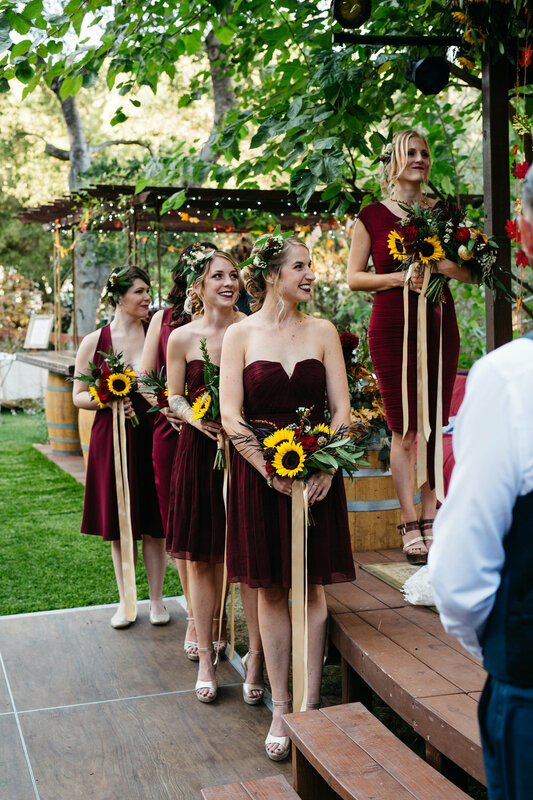 The couples love for all things Autumn made October the perfect month for their special day. 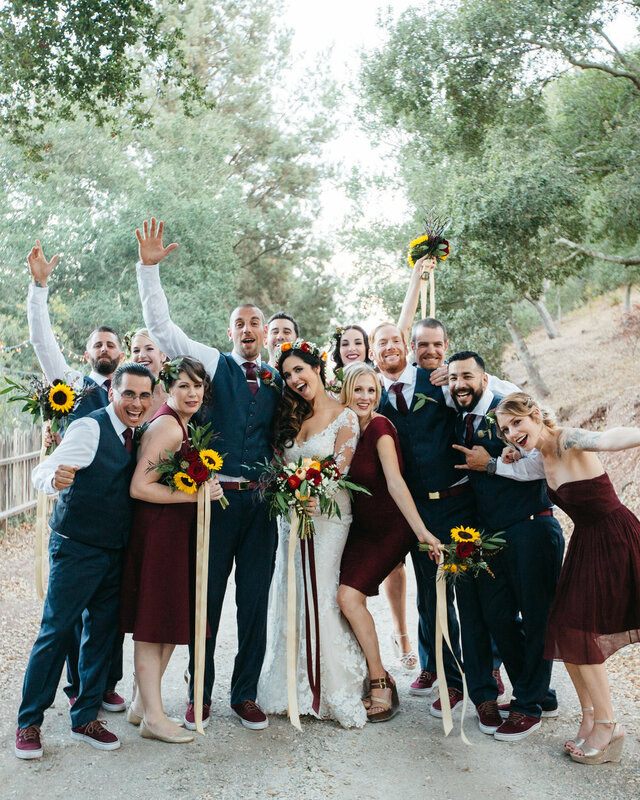 Rich Autumn hues such as burgundy and copper created a warm and romantic vibe and since Rachel has a love for sunflowers that was a must have in the stunning floral arrangements made by EFW Floral and Design. For the venue they wanted something unique with a lot of greenery. 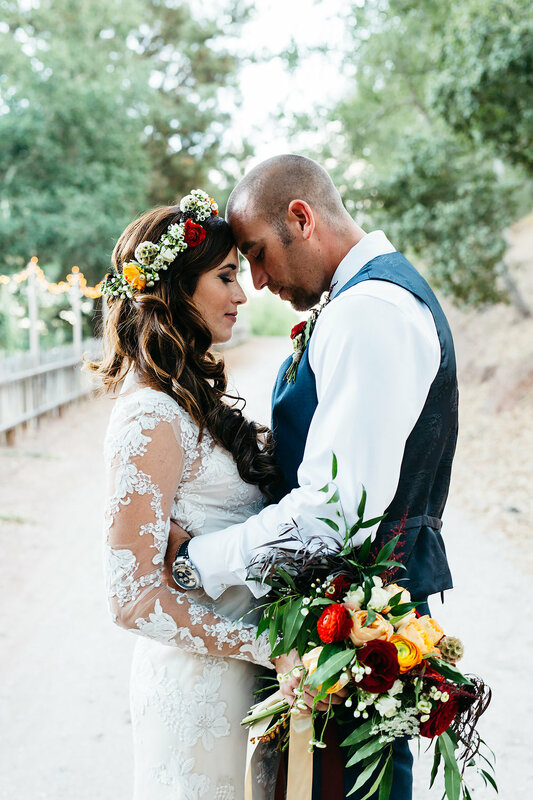 When we came across Dancing Oaks Ranch in Ojai it was a done deal with its lush greenery and stunning waterfall. The large slope created a bit of a challenge but the idea to make blankets available to guests to watch the ceremony on the grass was a perfect way to utilize the space and incorporate the cozy autumn vibe. 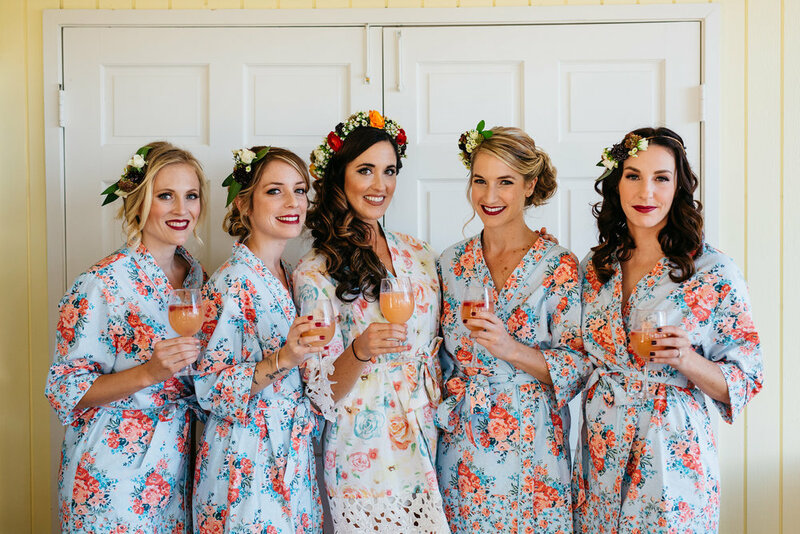 With Rachel and Mike’s genuine and laid back personalities it was no surprise to me that all their friends and family jumped at the opportunity to contribute to their special day. Rachel and her mom made the most amazing ceremony backdrop by using autumn leaves, tiny mirrors, and twine. A friend who makes signs for Trader Joes contributed the most amazing handwritten signage. Rachel’s work donated boxes full of candles which enhanced the romantic vibe. 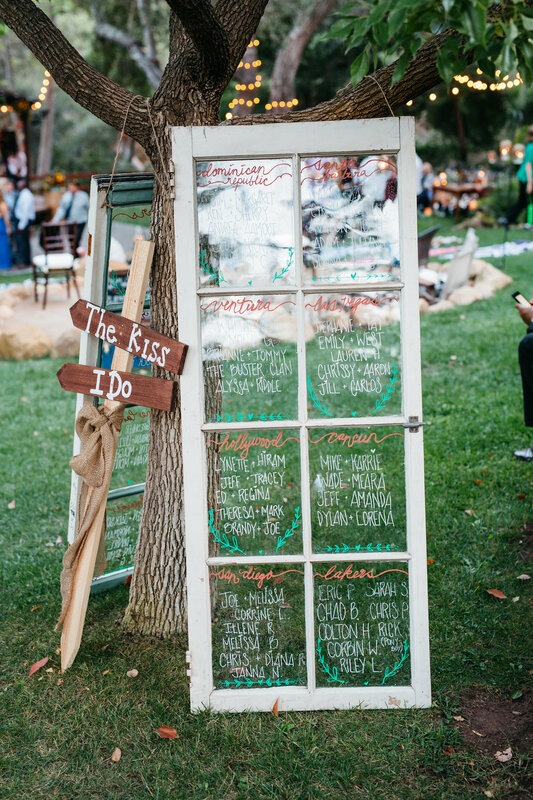 Handpicked Rentals from Party Pleasers added the finishing touches. 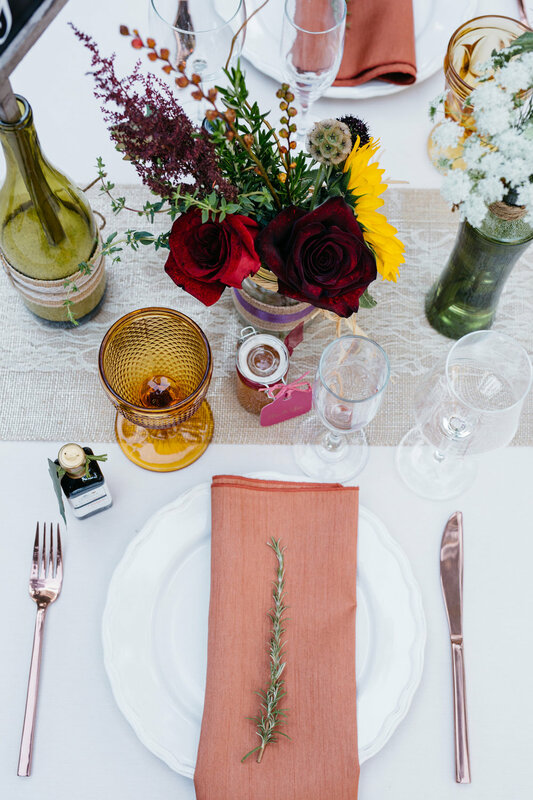 Copper flatware and napkins matched with mismatched goblets in shades of purple, green, and orange were perfection. Not to mention the red velvet chairs that the sweetheart table could definitely not live without! You could truly sense the love that not only Rachel and Mike have for each other but also for their friends and family. It felt like an intimate dinner party that literally ended with drinks around a fire pit. The speeches were more heartfelt than any I have heard before. There was not a dry eye in the house.. that is including myself haha! Rachel and Mike’s main goal for the day was to have fun and spend it with the ones they love and they definitely succeeded! It is rare to come across such amazing people and I was definitely sad when the year of planning came to an end but seeing the vision come to life was so special!